I loved The Cruel Prince. I knew I had to pick this book up as soon as I could get my hands on it. Unfortunately, I didn’t land an ARC, so I had to wait until release day. That’s not a bad thing, but the closest book store didn’t have them out and I almost cried. I legit had tears in my eyes. Luckily, they were able to find me a copy and even gave me a bit of a discount! Enough of story time, Tiffany. This a book review. Not a review of the bookstore you bought the book in. 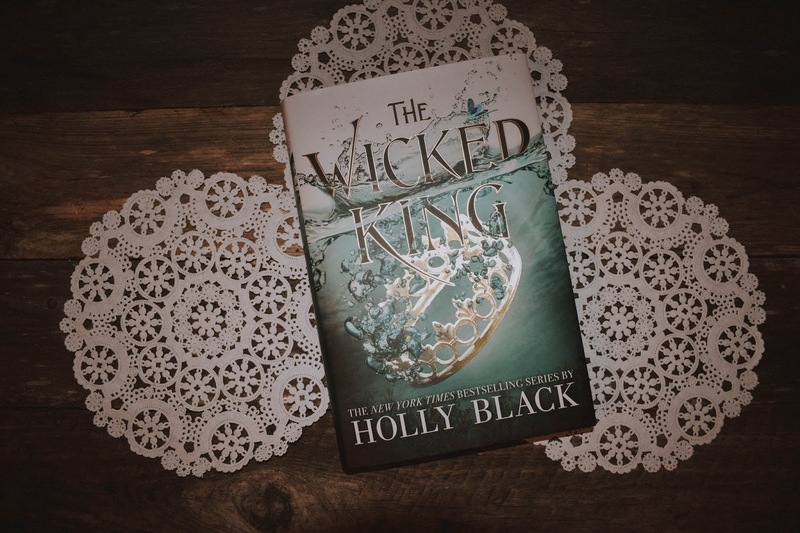 The Wicked King is the sequel to The Cruel Prince and what a sequel it was! I loved this book more than I loved TCP. I honestly didn’t think this book was going to top the first one. I legit made myself late for work one day because I did not want to get out of my car because of this book. I really love Jude and Cardan’s relationship. The hate-to-love trope is my favorite. It’s still a little more hate than love, but they’re growing and I’m here for it. I was LIVING for chapter fifteen. My angst just grew from that chapter and I needed more. Cardan has become a more likable character. He’s not as cruel as he was in the first book and I love that. He’s growing as a character and he’s proving that he can do things on his own without the help from others. Still love his tail and I hate when I see anything that makes fun of it. I’ll fight you. I loved all the little twists and turns in this one. Black threw in a nice little plot twist at the end of TCP. She threw in quite a few in this book. I wasn’t expecting some of them, like at all. So much betrayal. So much scheming. I LOVE IT. I still really love this world that Holly has built. It grew, adding the sea life to it. I’ve never read any books with mermaids in it. It was a great experience seeing life underwater for the first time. I really just hate the fact that I have to wait an entire year… again. Normally, I don’t pick a series up unless it’s close to being done or is already done. The waiting game isn’t for me. I’m not a patient reader. Maybe I’ll get an ARC of Queen Of Nothing??? This has to be one of my favorite series ever. These books are just done so freaking well. I cannot get over them. Holly is becoming one of my auto-buy authors and it’s because of these books. If you haven’t picked up The Cruel Prince yet, you really should. You won’t be disappointed. If you have read TCP and haven’t picked up The Wicked King yet, WHY ARE YOU WAITING??? ?